the amount is reasonable and a proper use of public money (that is, the payment will withstand scrutiny). Many severance payments are negotiated with the help of legal or other representatives. Using experienced advisers is wise in any sensitive or difficult situation. In the public sector, employers will often be required to justify the terms of a negotiated exit, including any severance payment. Reasoned legal advice (in writing) will be helpful or even essential if the employer is asked to explain the basis for a severance payment. We encourage employers and employees to attend mediation when they have a dispute. The Crown is required to be a good employer and to act in good faith, and to be an exemplary litigant. Agreeing to attend mediation promptly is consistent with those requirements. It can help to avoid legal action, and sometimes it can help to resolve disputes early and before positions become entrenched. a written record of the basis for settlement. In the public sector, there are often legal obligations to disclose severance payments (mentioned above). The standard wording for confidentiality clauses provides that the discussions and terms of settlement are confidential, "except as required by law". This wording should always be inserted into settlement agreements where confidentiality has been agreed. Severance payment agreements, like all legal contracts, must be documented correctly. The terms must be clearly spelled out, with financial and intangible components, timing, and the parties' respective obligations carefully defined. The nature of each type of payment should be specified, and the basis for the payment should be explained so the document is self-explanatory. Any ambiguities can result in misunderstandings, interpretation arguments, or even legal proceedings. The public entity needs to keep a clear paper trail recording the background, risk assessment and advice obtained, basis and reason for the severance payment and terms, and evidence of the required authorisation. The amount of any severance payment must be reasonable in all the circumstances, although this is, by necessity, an imprecise requirement. Settlements larger than an award in comparable cases decided by the Employment Relations Authority or the courts will be given greater scrutiny, and the public entity will need to have good reasons for the amount. Good reasons for a comparatively higher payment might include the seniority of the employee, the effect of any publicity on all the people involved, the sensitivity of the dispute, and the value of certainty and speed of resolution. These factors can justify a higher settlement because the outcome is better than going to court. Severance payments must be approved at the correct level of delegated authority. The authorisation required (that is, general manager, chief executive, board, or minister) will depend on the amount of the severance payment (that is, payments in addition to or in excess of contractual entitlements), in keeping with the rules applying to the particular public organisation. The amount includes all financial costs, excluding Goods and Services Tax. For government departments, Cabinet sets specific approval procedures and financial delegations for agreeing to any kind of settlement and payments that are not legally required. Payments above the thresholds must be approved by the responsible Minister or Cabinet. Compensation and settlement payments must also be certified by either a departmental solicitor or the Crown Law Office. Most public organisations will have some kind of obligation to disclose severance payments. Accounting standards require the disclosure of some payments in the financial statements, and the governing legislation for some types of public organisations contains additional requirements for what must be disclosed in the annual report. Whether a particular payment needs to be disclosed will depend on the specific wording of the relevant legislation and accounting standards. For a summary of disclosure requirements, please see Part 3 of our good practice guide on severance payments. A statutory disclosure requirement will override any contractual undertaking; public entities cannot contract out of their statutory obligations. 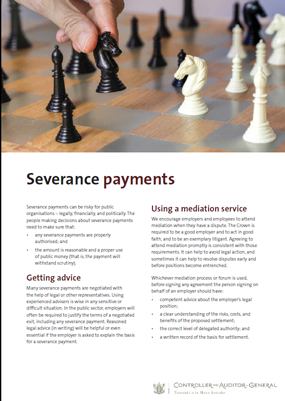 For more information on the processes and principles for severance payments, please see Part 2 of our good practice guide.